More than 12 years of research led Anath Shalev, M.D. (right, with Junqin Chen, Ph.D.) from a basic discovery to the first human trial of a new type of diabetes drug. In 2002, diabetes researcher Anath Shalev, M.D., asked a basic question: What gene in the insulin-producing islets of the human pancreas is most turned on by high levels of glucose, a hallmark of diabetes? Anath Shalev explains verapamil's protective effects against diabetes, and a new human clinical trial of the drug at UAB, in this video. Beta cells are critical in type 1 and type 2 diabetes. In both diseases, the cells are lost gradually due to programmed cell death (apoptosis); but the trigger for that programmed death was unknown. The loss of beta cells contributes to the progression of diabetes, a growing worldwide epidemic that affects more than 20 million people in the United States, making it the seventh leading cause of death and the source of complications like blindness and more than 40,000 lower limb amputations a year. The beta-cell gene that responded to the high glucose in Shalev’s 2002 experiment produces TXNIP (pronounced "ticks-nip"), a protein normally involved in controlling oxygen radicals in many types of cells but never known to be important in beta-cell biology. Its response to glucose was intriguing because TXNIP (thioredoxin-interacting protein) was already recognized as a regulator of thioredoxin. Overexpression of thioredoxin had previously been shown to prevent experimentally induced diabetes by inhibiting the programmed death of islet beta cells. Since TXNIP inhibits thioredoxin, and because Shalev had discovered that islet TXNIP was highly regulated by glucose, Shalev realized that TXNIP might have major implications for beta-cell biology. What does it take to go from a basic microarray gene discovery to a human trial of a completely novel drug to treat diabetes? A dozen years of elegant research unraveling the control and function of a protein called TXNIP. Over the next dozen years, Shalev — who left the University of Wisconsin–Madison to head the UAB Comprehensive Diabetes Center in 2010 — set out to reveal how TXNIP acts in cells at the molecular level, knowing that an understanding of those molecular mechanisms might point to possible new diabetes treatments. The payoff has been substantial: Using cell cultures, mouse models and pancreatic islets isolated from humans, the Shalev lab team has shown that manipulating TXNIP levels up or down in beta cells could exacerbate or protect against experimental diabetes. 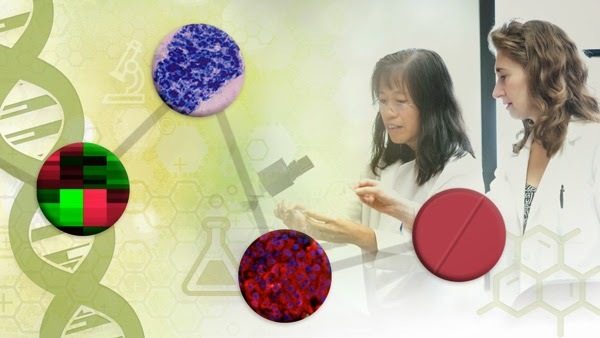 Details about the research journey show the incremental steps that basic science takes, and how those connected steps sometimes lead to potential clinical impacts. In 2005, the Shalev lab team found that beta-cell TXNIP levels are higher in mouse diabetes models, and that experimentally increasing TXNIP levels in rat beta cells in vitro led to increased programmed cell death, by means of a well-known trigger signal of apoptosis. The Shalev team also found that sugars in general, whether metabolized or not, turn the TXNIP gene on. This clue led them to a newly identified carbohydrate response element (ChoRE) in the TXNIP promoter that acts as a regulator of TXNIP. "I actually went down to the mouse house to see if the mice were getting diabetes," Shalev told The Birmingham News in 2012. When she found normal glucose levels, "We were dancing." Another Role for TXNIP, Another Drug Target? In 2013, TXNIP was shown to play another crucial role in beta-cell biology when the Shalev laboratory team discovered that high levels of TXNIP directly blocked insulin production in beta cells, acting through a newly identified pathway. TXNIP, they found, induced a microRNA called miR-204, which in turn down-regulated the MAFA transcription factor involved in promoting transcription of the insulin gene. This means that miR-204 may offer another target for a future RNA drug, an area that is currently also being actively pursued by the Shalev lab. MicroRNAs, with 20 to 24 noncoding nucleotides, have rapidly gained prominence as regulators of gene expression in health and disease. Researchers are beginning to explore whether silencing targeted microRNAs may lead to a treatment for cancers or other diseases. This year Shalev reported that TXNIP — surprisingly — can induce its own transcription. Her UAB research team found that TXNIP does this by affecting the same ChoRE binding protein (ChREBP) that was previously found to be key in the response to the drug verapamil. The researchers experimentally elevated TXNIP levels in beta cells and found this caused decreased phosphorylation of ChREBP, which led to its increased entry into the nucleus and its increased binding to the TXNIP promoter to boost transcription. This creates a harmful positive-feedback loop. The story doesn’t end here. Shalev’s long trail of laboratory research has now led to the first human trial to see if verapamil has an effect in patients who have developed type 1 diabetes within the previous three months. Adult volunteers, ages 19-45, will be treated with verapamil or a placebo for one year, as their insulin and blood glucose levels are continuously monitored. The three-year, $2.2 million trial will be conducted by the UAB Comprehensive Diabetes Center with funding from JDRF, the largest charitable supporter of type 1 diabetes research. So Shalev’s simple question — what gene in insulin-producing beta cells is most turned on by glucose? — has thus led the research out of her laboratory to possible new drugs, acting against a novel target to alleviate or reverse diabetes.